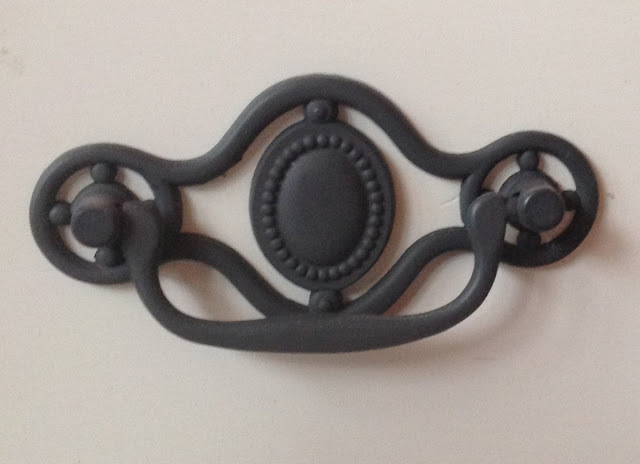 We just introduced this line of oil rubbed bronze baroque hardware a few months back and have already sold out of one of the knobs! The products are so popular because of the their style and price. Over the last couple months I've had the pleasure of receiving a lot of photos of this cup pull from happy customers, so I thought I'd show it off in an article! Several of the projects use the matching knobs as well! Jane at Vintage Transformation Studio us them on a cute little desk and I love the outside staging area. Beautiful photos! Boxwood & Brass has contributed a lot of photos over the past year and we are very appreciative of their work and their willingness to partner with us. 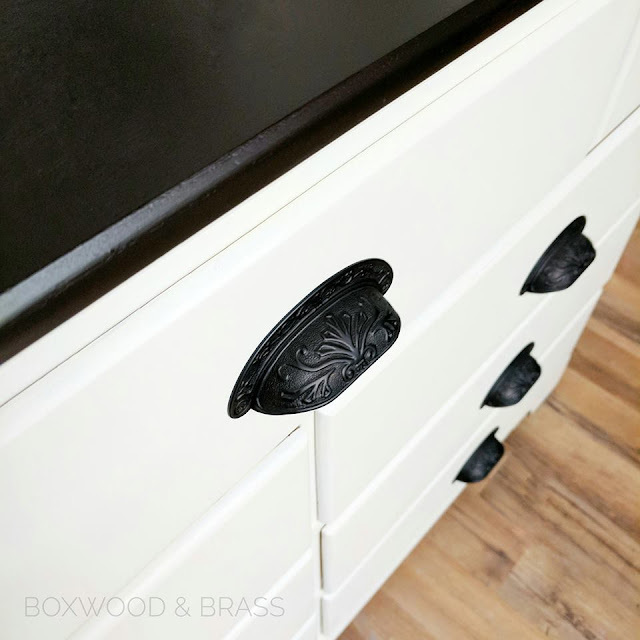 I really love the contrast between the cup pulls and top and the bright white on this dresser. great staging again! Re-luv'd Furniture out of Oregon sent us this cute little secretary and I love the photo because I don't think I'd have ever though these cup pulls would go with a blue piece but the dark navy blue and the dark oil rubbed bronze really look nice together! I believe Melissa at Vintage Keiralie did this desk makeover as a present for her father she said when posting to the group. I bet he was ecstatic! A true beauty and I can see myself penning a letter on this beauty! Haha, does anyone write letters anymore? 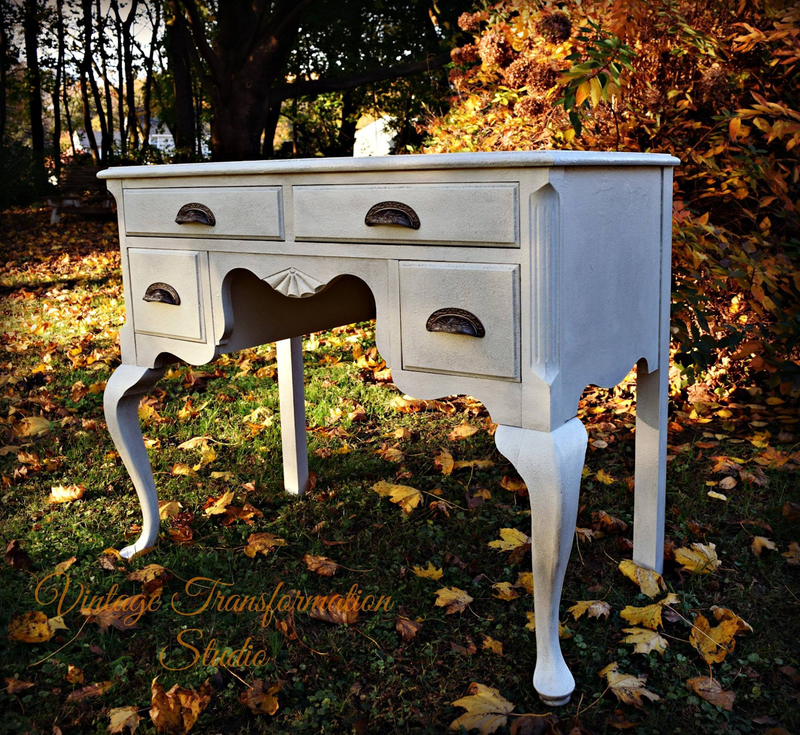 Lori at Butterfly Furniture sent in this lovely lingerie dresser with a pull on each drawer. I think the paint job goes great with the bronze cup pulls. Like a deep sea blue with a touch of bronze or black in the paint job? I can't tell, but it looks wonderful! Kim at Furniture Rescue sent in this cool whiskey themed dresser. I've been known to enjoy a whiskey or too and probably enjoyed a few too many last time I went out, haha! Really cool and the dark cup pulls go well with the dark (stained I'm guessing?) wood. And finally a beautiful piece from a new member of the DLH Friends group Lee Ann at Simply Divine! Great Christmas staging and the I think the oil rubbed bronze pulls go perfectly with the paint job!! It's almost like there is a bit of bronze in the paint shading! Maybe there is...as you can tell I'm no painting expert, lol, I stick to hardware. Don't forget to join our mailing list as I post more beautiful customer and blogger work featuring our hardware as well as some nice weekly deals. First up is Sarah at Sweet Redemptions. Sarah does beautiful work and I was quite excited to pick her up not only as a customer but as a group member. The before looks like the piece of junk we've all got in the guest room or somewhere just begging to be tossed or upgrade. The final product is worthy of the showroom! 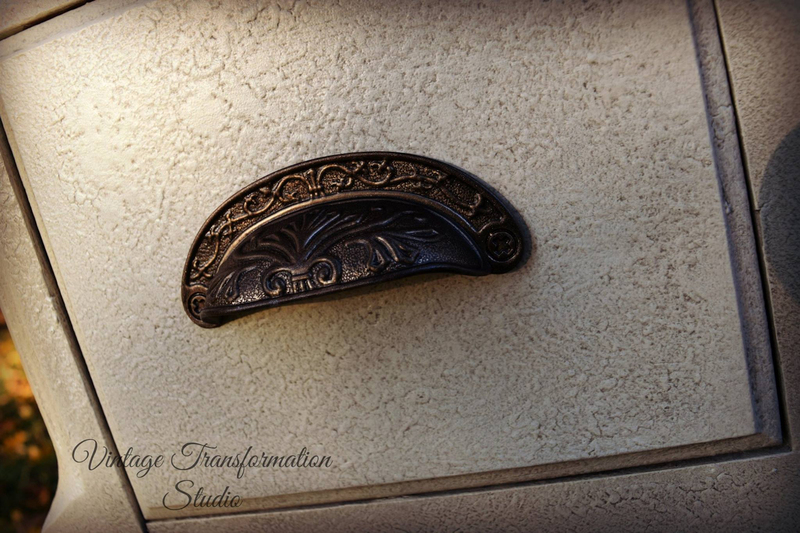 Sarah also used our new baroque style hardware (which I guess I'll stop calling new eventually...LOL!) which makes me VERY happy. We'll have these cup pulls in three new finishes early next year. Next up, DOUBLE J! Jeanne & Janice from Amazing Grace Furniture Revival! They took this boring old piece, which obviously had some potential which the great detailed doors and drawers, and turned it into truly unique piece. ANNNND they used our other finish of baroque cup pulls in verdigris! I really love this piece! I've known Colleen of Painted Gem Creations for awhile now and I'm lucky I do or she'd be putting someone else's hardware on her beautiful work! Again, we have a boring entertainment center like so many of us have sitting around being boring. Total change up and the result looks fantastic! The distressed blue paint job alone could brighten up a room! And the mission style hardware is an unexpected nice touch as this piece definitely isn't a mission style any more! This is why I don't choose hardware for people...only the artist knows what piece is perfect. To finish up we haveTeri from Paint by Layers. I was just perusing Teri's page and it appears she's one of those super productive people that put the rest of us to shame, lol! Looks like she's putting out a piece of the same quality as below every week! I love the paint job and how it brings out all the nice details in the original wood! She used cup pulls instead of bails on the update and I think it look wonderful! That's all til next time. If I forgot anyone that has given me before and afters it's just because I'm the least organized person in the world! So please just remind me or send again because I want to feature everyone! Also, join our mailing list!! I am starting a new series today that I hope will be a long one. Over the years I keep pressuring myself more and more to shop at small businesses instead of big box stores. I know that if I expect people to shop with me then I need to be reciprocating. I know it's hard and I don't blame anyone for getting the best price wherever they can get it, but as I shop at more and more small businesses I have begun to realize that THEY HAVE THE BEST PRICE. Or at least, once you factor in service and quality they are very competitive. So without further ado, the small business I frequent the most, Pottstown Meat & Deli. They have a great small business feel. They are very friendly and the meat is always fresh! Their Facebook page is has all of their information and they have quite a nice following for a deli! You can see why with the photos I grabbed from their page. My favorite thing is that they carry grass fed beef and bison from local farmers in the central, IL area. "For 4 generations and over 100 years, the Barth family has had the great opportunity to provide the Peoria area with the finest pork and choice beef available. Customer satisfaction has always been our number one goal. Years of experience along with customer feedback has allowed us to deeply understand our customers’ needs. In 1995, Pottstown Grocery, Meat and Deli put in our first smokehouse, providing our customers with some of the finest smoked hams, sausages, bacon, etc. that many of our customers had not experienced in years." And now for the gross part! HHAHAHAAHA! I have these photos because I send them to my mom to gross her out. 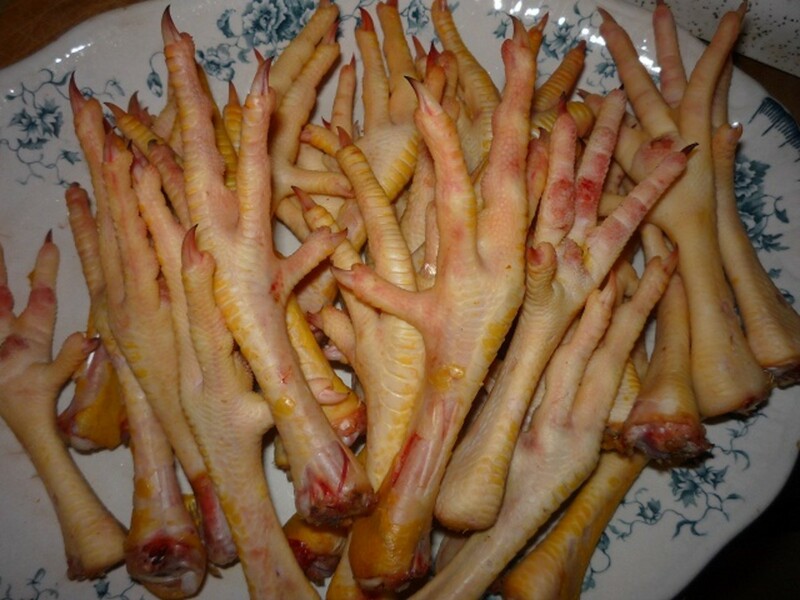 I buy pig tails, chicken feet, and pigs feet to cook up as healthy treats for the dogs! YUMMY! The last picture is Patxi digging into a delicious pig foot! So I know we have a few customers in this area. If you are reading this check out Pottstown Meat & Deli! And join our mailing list to support our small business! First up is Debra from Down Tyme Design. By the looks of her page, Debra is just getting started, or only recently started a page, but I can tell she's got a real knack for this regardless! 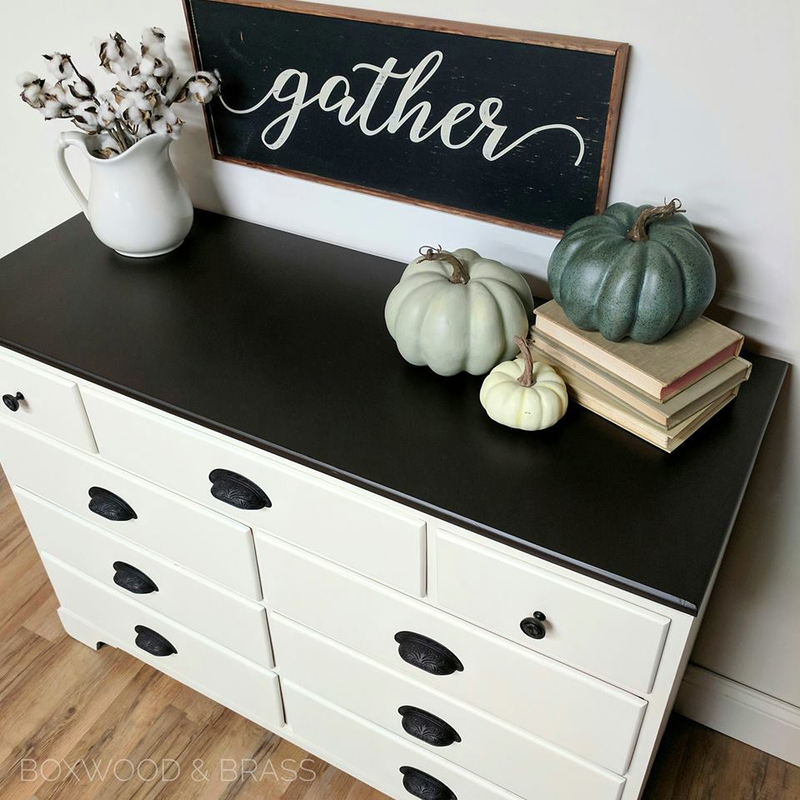 I love the two-tone final product and if you click over to her page you can how she has updated this piece to match the table as well. Looks like she may have added some nice cabinet lighting too, the china looks great! Members of the group probably know Stacey from Renewed Spirit Home as she is a regular contributor and uses our hardware on a lot of her projects. When I asked for before and afters Stacey naturally had a lot of them! I am a big fan of adding ornate detail to old pieces to mix it up and Stacey does this very well using our wood appliques collection. The armoire shown first is my favorite piece, but each one is a beautiful makeover on it's own. Amanda Luebeck of Luebeck Creations does fantastic work and has used our hardware on several projects before. 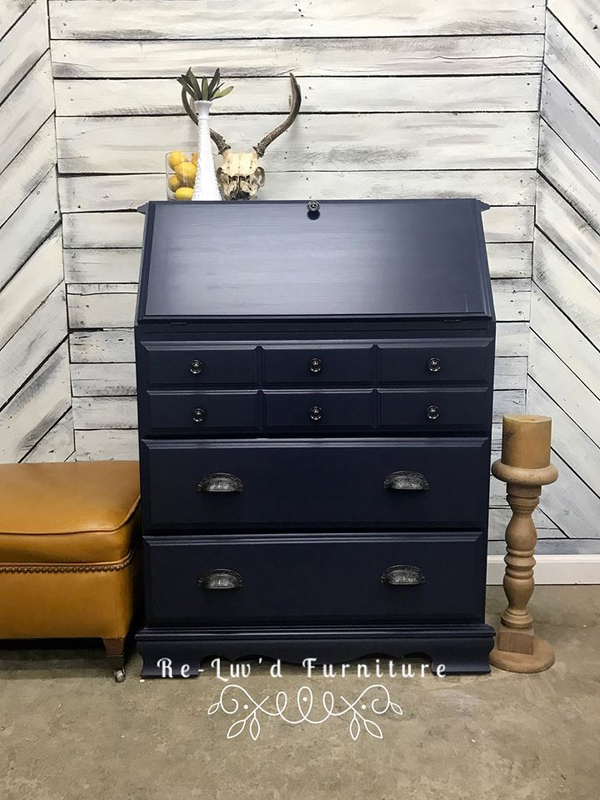 Amanda used matching knobs and pulls on this dresser update and the result is very nice! She also took the time to make this before and after graphic which is perfect for sharing so I think I'll put it up on Instagram too! Susan Tuthill of REHABArt.com sent in these photos of some awesome chairs she totally remade using obviously new upholstery and also some appliques of ours for detail. This update took some true vision and some guts to go with such a bright pink! I really love the matching pair! Susan also has a Facebook page at Rehab Art LLC. One of the biggest joys I get from the group is meeting new people that have been using our hardware a long time. It's so great to see their work and to get the pleasant surprise that such talented people are already customers. Natalie of A Ray of Sunlight fits this description perfectly. I'm so glad I made her acquaintance and when I asked for before and afters featuring our hardware she had a ton! So, she's a great place to end this post, please check out her page for even more nice work! I love that she used our labels so many times! That product line has brought us a lot of new customers. That's it and please join our mailing list to see more before and afters and to get weekly deals and ramblings from me!